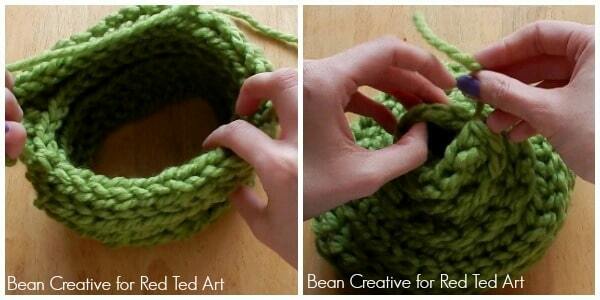 As you know we love love love finger knitting here on Red Ted Art. 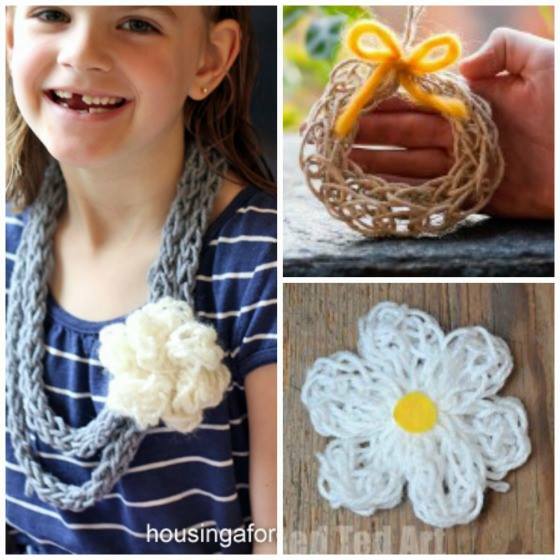 Finger knitting is a great way to get kids interested in knitting and yarn crafts and is something they can easily progress from later. 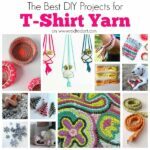 It is why I am always looking to create new Finger Knitting Projects, as well as staying on the look out for great Finger Knitting Tutorials. I few weeks ago, I spotted the lovely Bean Creative on YouTube (do visit and subscribe today!! 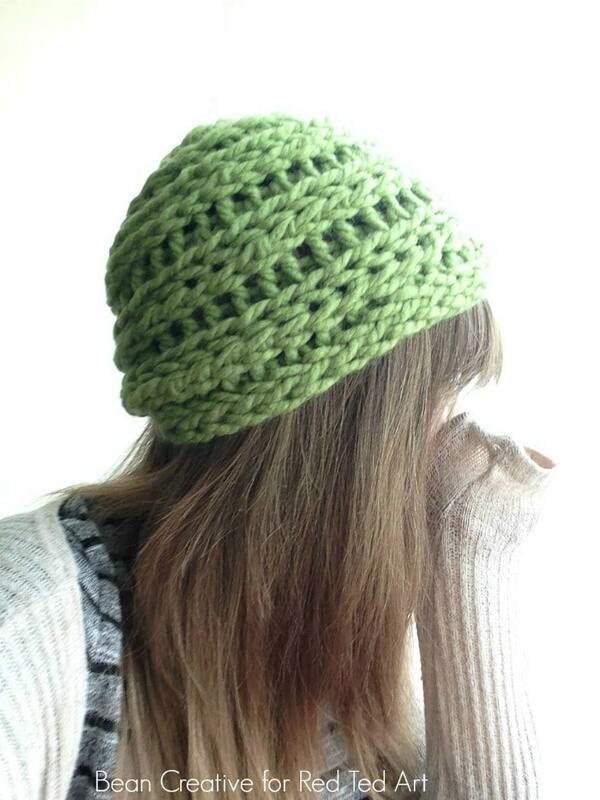 ), who had created a finger knitted Beanie Hat DIY. 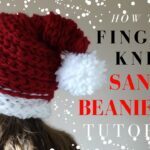 Bean Creative has now also created a FABULOUS Finger Knitted Santa Hat! Hop over for info! 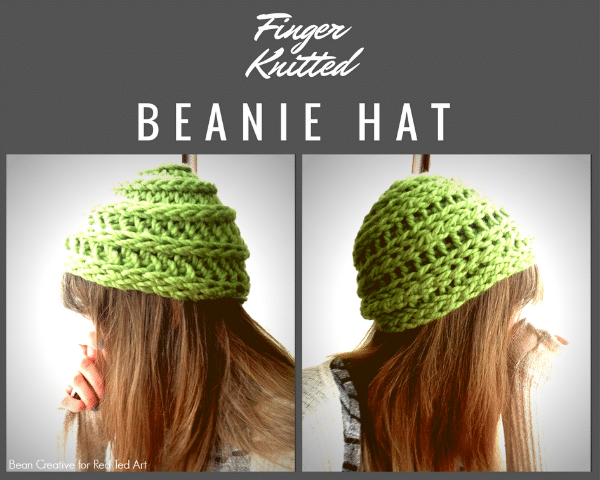 Now a finger knitted beanie is something that I have been LOOKING for, for at least 2-3 years when I met a lovely crafter at a blogging conference who told me all about them. 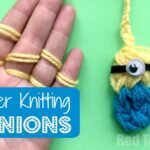 Though beanie hats no doubt are for the more experience finger knitters, I thought that these are a great project for those kids (tweens/ teens/ grown ups??) 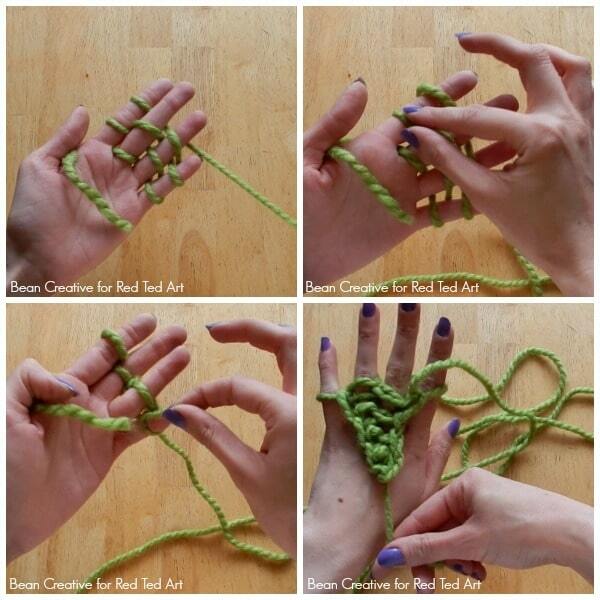 who still love finger knitting but have moved on to something “bigger”. 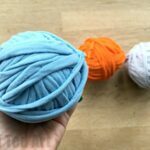 The great thing about these hats, is that they are relatively quick and easy to make. 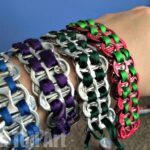 They would be brilliant little “fund raisers” for older kids to make and sell to friends/ family or school fairs. Just lovely. And who doesn’t want to know how to make a hat, right?! 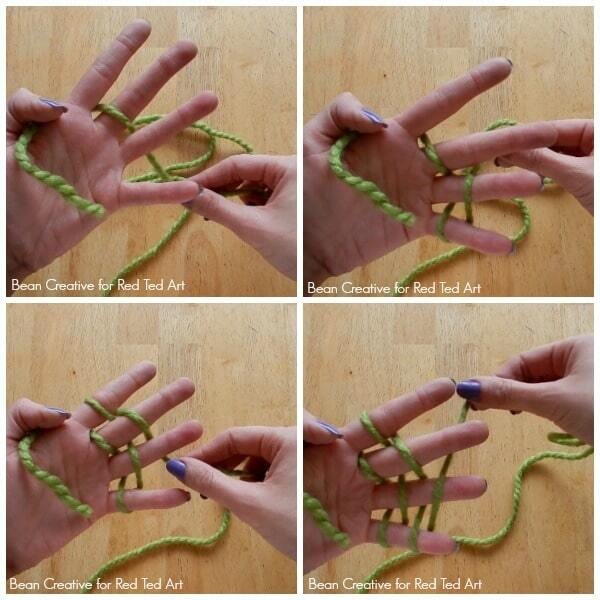 The fabulous Bean Creative has agreed to share this brilliant finger knitting how to with us. 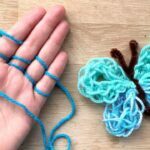 I will start off with her brilliant Finger knitting VIDEO tutorial (really, it is all you need to see!! ), but she has kindly provided some fantastic How to Finger Knit a Beanie Hat written instructions too! WATCH this BRILLIANT video or follow the written instructions below. Or if you would rather… read on for step by steps written and photo instructions! 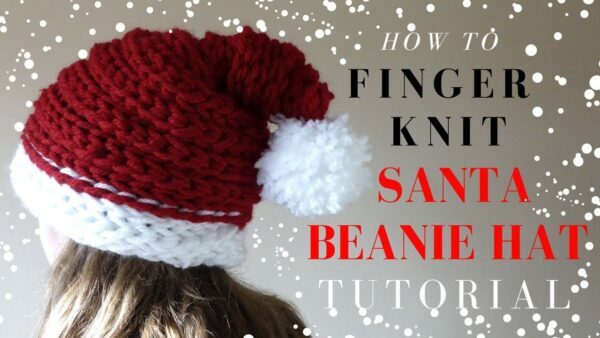 Now the lovely Bean Creative also has a fabulous Finger Knitted Santa Hat!! Hop over and check it out! The basic understanding is needed for this tutorial but I do show how in the first 5 mins. Hold the wool comfortably with your thumb.Wrap the wool behind your index finger and in front of your middle finger. Then behind your wedding finger and around your pinky. Then in front of your wedding finger, behind your middle finger and around your index finger. You need to do it again. Wrap the wool in front of your middle finger. Behind your index finger. Then around your pinky. In front of your wedding finger, behind your middle finger and then around your index finger. So you have two loops on each finger. Now you need to pull the bottom loop up and over the top loop. On all fingers So you’re left with one loop on each finger. Then start again. Keep repeating these steps until you have a long enough piece. Long enough to wrap around your head. The next step I show how I connect the piece together to make a circular shape to form the hat. I also show how I continue to knit on. Connecting the knitting together as I go. Adding height to the beanie. Now we are going to connect the two ends together. Run your thumb through the ridge on the back.The ridge is the back and the reverse side is the front. Facing the ridged side in towards the center. Making sure you don’t twist it. Connect the two together by hooking your little finger into the bottom loop and the top loop of the end of the knitted piece.So you have three loops on your little finger. Then start knitting again as normal. When you start to pull loops off your finger, just one thing. On your pinky finger, pull each loop up and over individually. Leaving one loop. Give it a tighten by pulling on the wool. This stage is similar to the last step. I hook into each loop along the ridge of the knitted piece with my little finger. With two loops hooked on my finger I simply start to knit again I repeat this process. Adding more rows and height to the beanie hat. Measuring off my own head. This time we only need to hook into one loop. Find your next loop and hook your little finger into it. Then knit another row. On the little finger. Pull each loop off individually. Pull to tighten. Find your next loop and hook into it. Knit another row across. Keep knitting until the hat covers your head. Remember to keep trying on the hat for measurements. The next stage I show how to decrease the size of the hat. 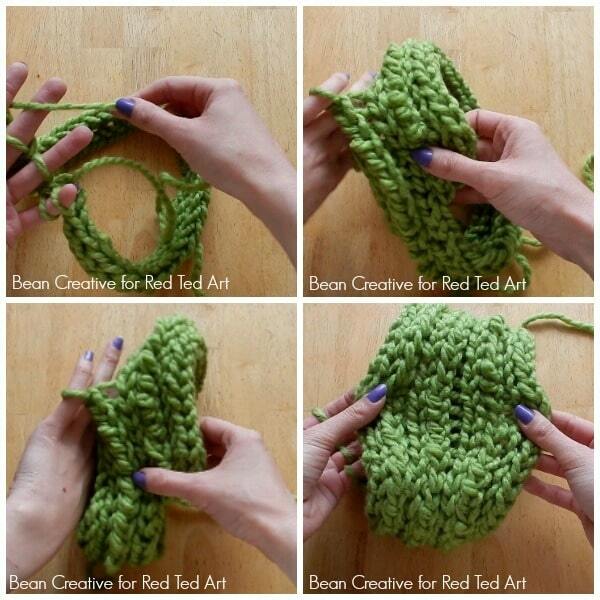 To form the dome shape of the top of your beanie. After I measured off my head and I am happy with the height. Take up two loops this time, as appose to one. Continuing until you are left with a tiny gap at the top. Next stage is to make the top of your hat. We need to start decreasing. This time you need to pick up two loops. So you have three loops on your little finger. Then start to knit another row. Keep repeating these steps until the top of your hat is almost closed. Leaving a small gap. Start casting off your fingers. Pull the first loop off and onto your next finger. And pull the bottom loop up and over the top. Do this on all your fingers.Until you have one left. Then pull the wool through the last loop. Get a scissors and cut the loop. To close off the top. I laced through each loop across the top. Keeping it nice and tight. Closing the top off completely. Make sure you keep pulling tight. You need to tie a knot in the wool to finish. 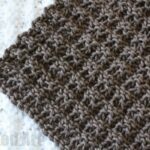 Isn’t this just the COOLEST Finger Knitting Project ever? 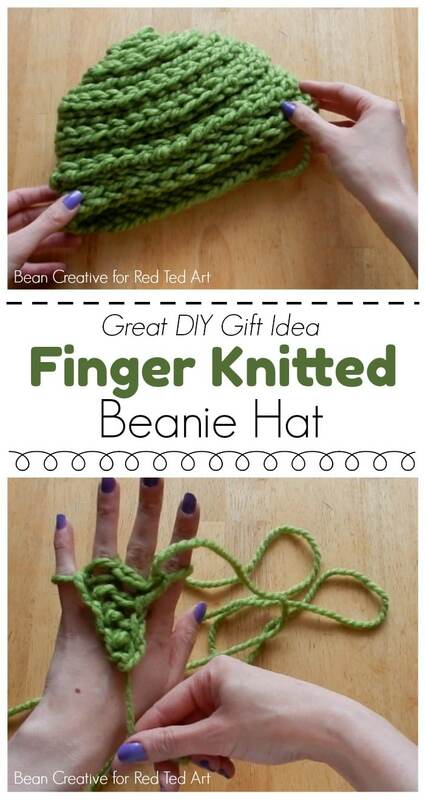 The perfect finger knitting project for teens and experience finger knitters. I can’t wait to have a go! Excellent Tutorial and video thank you! Brilliant work!!! I love Red Ted Art for their unbelievable skills. I am afraid I can’t take credit for this!! Sounds like a success to me!!! Would love to see a photo!